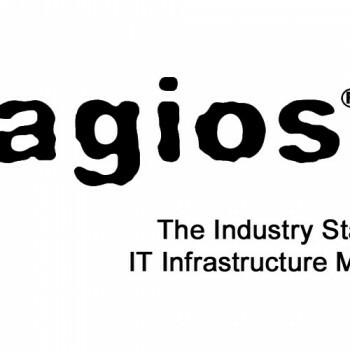 This is a quick manual on Nagios configuration files. We will be explaining which configuration files you need to edit to add hosts, services, contacts and groups. 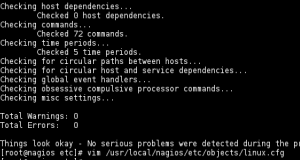 Learn how to configure your Nagios from Linux console and check the configuration for errors. In this Nagios configuration How To guide we will explain most of the files that are needed for Nagios to monitor your hosts and services and send alerts. Nagios.cfg is the main configuration file for your Nagios Core. This is where the location of Nagios log file, status.dat file, lock file and host and services state update interval is defined. It also defines Nagios user and group under which Nagios instance is running. By default you do not need to change any of the lines in this file and Nagios should be working perfectly. But this is the file you should add a line to, if you have a separate configuration file for monitoring Linux (or other) hosts (cfg_file=/usr/local/nagios/etc/objects/linux.cfg). If you have installed MK Livestatus, this is where you will have to define a “broker_module” – broker_module=/usr/local/lib/mk-livestatus/livestatus.o /usr/local/nagios/var/rw/live. This configuration file defines Nagios access for people or groups. It focuses on Nagios web frontend configuration. 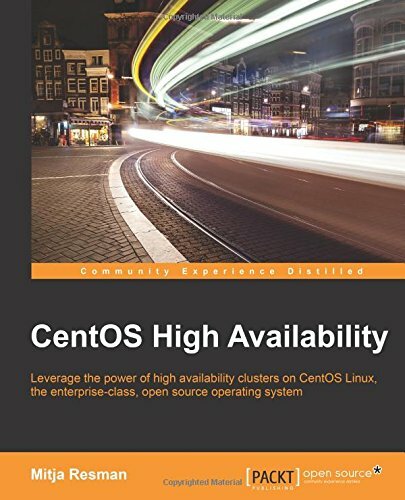 You can define exactly what kind of rights certain users or groups have – authorized_for_all_services, authorized_for_all_hosts, authorized_for_read_only, … This is also where the main configuration file is defined and physical path to Nagios HTML files is configured. It also defines the URL Html path – if url_html_path=/nagios this means that Nagios is available at http://hostname.domainname/nagios. You can also define sound actions for certain alerts. By default this fileonly needs editing on user access rights. You can keep all of the hosts and services in one configuration file if you like, but i prefer you separate hosts and services based on operating systems. Host and services configuration files are usually located at /usr/local/nagios/etc/objects. Every host and services configuration file must also be defined in nagios.cfg file! 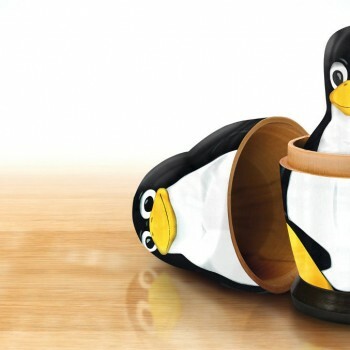 I will show you how to configure a separate .cfg file for Linux hosts. When creating a new linux.cfg file we first have to define host and service templates – and if needed hostgroup and service group templates. Below is and example of linux.cfg file with defined host, service, host group and service group templates and a Linux host foo.geekpeek.net with defined services for PING, SWAP usage and Current Logged in Users. check_command            check-host-alive   ; Default command to check if servers are "alive"
register                      1                  ; DONT REGISTER THIS DEFINITION - ITS NOT A REAL SERVICE, JUST A TEMPLATE! With this linux.cfg file we have defined a host foo.geekpeek.net in Nagios. This host is now visible in Nagios web frontend and Nagios is actively checking the state of the host and defined services. Of course client foo.geekpeek.net also has to have Nagios plugins and Nrpe service installed and properly configured. Command definitions for Nagios are defined in commands.cfg file. With these commands Nagios checks for hosts and services. Nagios locally runs a defined command, which responds back with the state of a host or a service. You can test these commands by running them from Linux console manually and checking their output. Contacts and groups are defined in contacts.cfg file. Just one contact is defined in Nagios by default – this is the Nagios admin. All of the other contacts need to be defined additionally. Below is a sample of defined contacts. There is a simple way to test the Nagios configuration for errors. 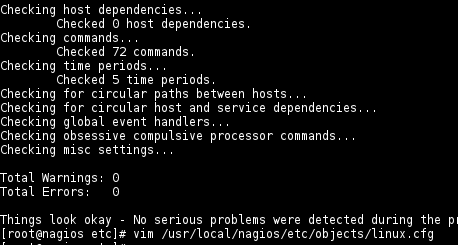 You should do this everytime you change any of the nagios configuration files to make sure, that the next time you will stop and start Nagios service the service will start and not fail because of some syntax error.